The old system for picking of surplus bakery items was to have the agency personnel pick directly from stacked plastic bread trays. 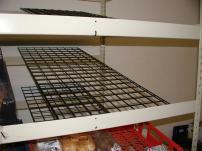 The stacked trays provided poor visibility of the items available, made it difficult to pull larger items from between the stacked trays, and required many hours of labor to sort, reload and restack partially empty trays. 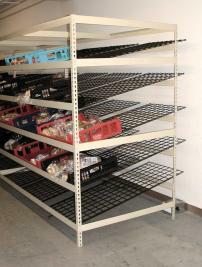 Preferred Equipment provided a custom designed flow shelf system, using an easy to assemble rivet rack with wire grid sloped shelves. This system provides excellent visibility, easier picking and automatic restocking when empty trays are removed from the front.